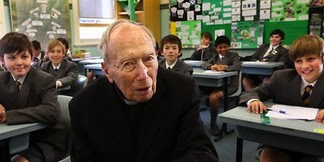 Australian Fr Geoffrey Schneider SJ, has been declared the world's oldest working teacher, by Guinness World Records. Father Geoffrey Schneider, who has been teacher and chaplain at Sydney’s St Aloysius’ College's Junior School for 47 years, said he has no intention of retiring, as he approaches his 100th birthday in December. Fr Schneider has taught at schools in Sydney, Melbourne and Perth, shaping the intellects and values of leading figures of Australian government, business, academia and sport, including Tony Abbott. Retirement doesn't appeal to him. Why retire, he said, “So I can read the paper every morning and then forget what’s in it? That’s what a retired friend told me happens to him...At 3pm there’s afternoon tea and if you don’t turn up in the first minute they come knock on your door and say, ‘It’s tea time now’. Father Schneider enjoys a fierce popularity at St Aloysius’. In the early 1990s, Year 3 students were asked to name a new building after their favourite Jesuit saint. Innocently, they chose “Saint” Schneider. “I didn’t worry about it at the time, really, but after that we received a direction that the Jesuits were not to have any buildings named after them while they are alive,” he said. Father Schneider is also the namesake of the annual Schneider Cup, which recognizes excellence in soccer and rugby.